Are you looking for a delicious beef recipe with a difference? If you are, you’ve found it! Here’s my tagliatelle with bolognese for you to enjoy. This is the real thing. 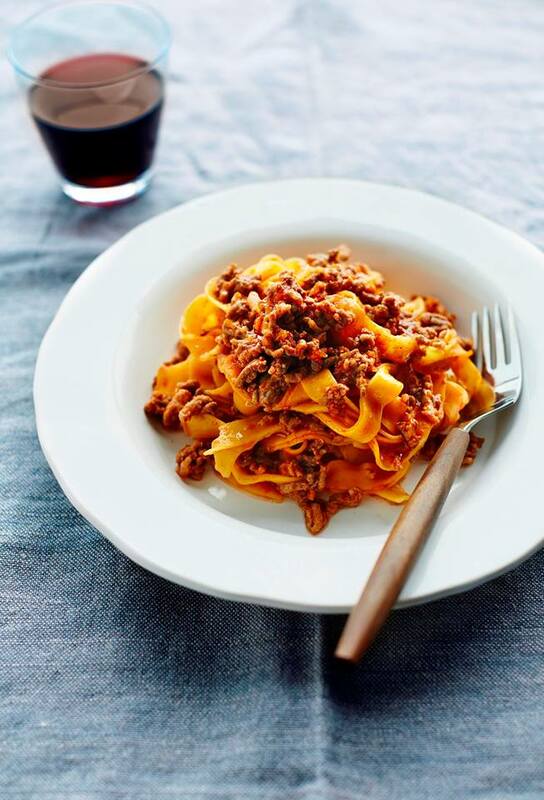 The genuine ragù, as it is made in Bologna, is a mouthwatering meat sauce that includes different types of mince, including pork and beef, slowly cooked in a tomato and vegetable sauce. In Italy, this sauce is only ever served with broad, flat pasta such as tagliatelle or fettuccine and never with spaghetti. 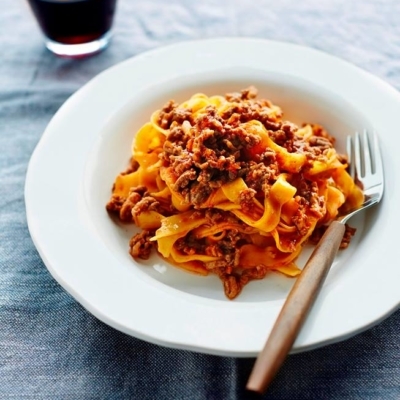 Feast your eyes on the finest tagliatelle with bolognese! It’s straightforward and fun to make this great dish. Simply follow the instructions below and get the perfect result. Heat half the oil in a large sauté pan and fry the onion, celery and carrot for 5 minutes until soft and starting to colour. While the vegetables are cooking, put all the meat in a large bowl, pour over the remaining olive oil and crumble the meat between your fingertips. Add the meat to the pan and fry until brown – around 5 minutes. Deglaze the pan with the red wine and allow to simmer for a couple of minutes, then add the milk. Simmer for 2 minutes before stirring in the tomato purée, passata and stock. Simmer gently for 3 hours until reduced and thickened. Once cooked, remove from the hob, season with salt and pepper then cover with a lid and leave for 20 minutes – you do not want the sauce to be boiling hot when you serve it. When ready to serve, bring a large pan of water to the boil and season generously with salt. Add the pasta to the pan and cook for 2–3 minutes or until just cooked. Drain the pasta, then return to the pan with the sauce and toss to combine. Serve in bowls with a few Parmesan shavings scattered over, if you like. Enjoy! 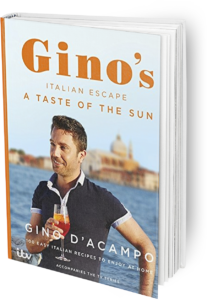 Once you’re done, simply sit back and enjoy your tagliatelle with bolognese and don’t forget to check out other great authentic Italian recipes including great antipasti recipes, Italian pasta recipes, Italian soup recipes, Italian beef dishes and authentic pizza recipes. There are literally dozens of recipes for this classic Sicilian couscous dish, most of which have the addition of seafood and chilli – but here I’ve let the sweet white fish do the talking. The town of Trapani is famous for couscous, and there is an annual couscous festival there in September. Ask your fishmonger for end cuts and bones to flavour the sauce. Nougat is sold in the street markets in most towns in Sardinia and the variations on offer are vast. The one I have chosen to feature in this book is the classic and most popular version and, in my opinion, the best. You can store it in an airtight container for up to a week, but don’t put it in the fridge as it will become soft and very sticky. Italians from the south don’t bake cakes all that often but my sister Marcella makes this for me whenever I visit and I love it. The combination of moist chocolate cake and fresh strawberries is wonderful and I can never only have one slice; in fact there is always a fight over who gets the last piece (I normally win!) The cake is also fantastico made with raspberries! Bruschetta is definitely one of the main dishes for an Italian antipasti. The freshness of the mint together with the broad beans is a fantastic combination that will fill you up and yet won’t leave you feeling heavy. You can substitute the broad beans with butter beans and if you don’t have fresh mint, use fresh leaf parsley or chives.